Children in Studley’s Shining Lights room have been testing their numeracy and problem solving skills by matching shapes and working on number recognition using a variety of great resources including mirrored numbers. 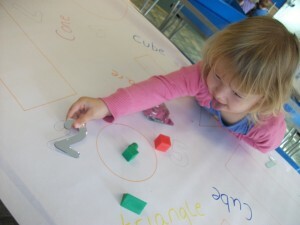 The children were able to identify many shapes, including cones and cubes in a fun and exciting way. Pictured is Elizabeth Thomas, age 3, demonstrating her number recognition skills.